Caesar’s account of the war in Gaul contain over forty references to ramparts, some native, but mostly those built of timber with a ditch in front constructed by his army in the field. I have argued that the three lines of double postholes with a ditch in front to the north of Hadrian Wall represent such a rampart. Recently, I have been trying out Google SketchUp as tool to explore the engineering of this structure, and express structural ideas visually. In a previous article I have discussed the issues of visual representations of the past, as distinct from models and diagrams. I bought my first CAD system in 1990, using it for my work in Essex, and subsequently offered my services to all the archaeological units and trusts working in England at the time; there were no takers. However, I had also realised that as a tool in my attempts to understand the evidence of prehistoric posthole structures, CAD was not yet the answer. 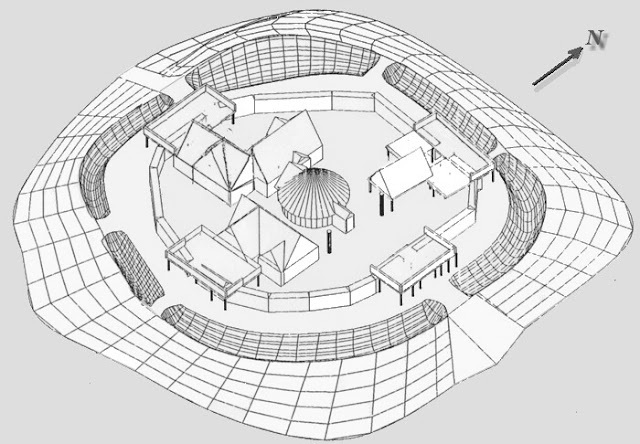 It was not just that it was slow, a 486DX 25 MHz computer running at would take 12 hours to print a shaded view, but even more critically, putting a cone on cylinder and calling it a roundhouse did not advance my understanding, it was simply an aid to drawing more accurate ‘artistic’ reconstructions. As soon as you start to model on a structural timber by timber basis a detailed understanding of how the horizontal elemental articulate with the posts is required. At the time, the aims of my research were gaining a systematic understanding of this relationship in archaeological buildings and structures. In short, I returned to tackling the problem using paper and pencil, working in plan, section, and elevation, which allows you to models ideas and find they don’t work, much more quickly. Modelling and analysis in order to understand complex data is at this level is a process of exploration and elimination; it is a jigsaw without a picture, where some of the pieces may or may not be missing. My ‘research’ consists of hundreds of scale drawings, all of which have proved to be wrong. However, having eventually found things that worked on paper I decided to do a PhD at Newcastle, only to discover they had thrown their CAD system away. Thus, after a certain amount of unpleasantness and mendacious duplicity, Theoretical Structural Archaeology became a child of Google, which by remarkable technical serendipity has always provided the tools required. Google SketchUp is a 3D modelling software, available free, which now has sufficient facility to do the things I need to do at present, and after a month of trying to do things quickly I have worked out how to do things properly; there are still limitations, both in my ability and the software, but we have reached a workable compromise! The model is based on the plan of the postholes recovered from berm between Hadrian’s Wall and the ditch at Shields Road, Byker, a suburb to the East of Newcastle. This comprises or three rows of double postholes, with the central pairs at 90 degrees to the other two lines. [Below]. 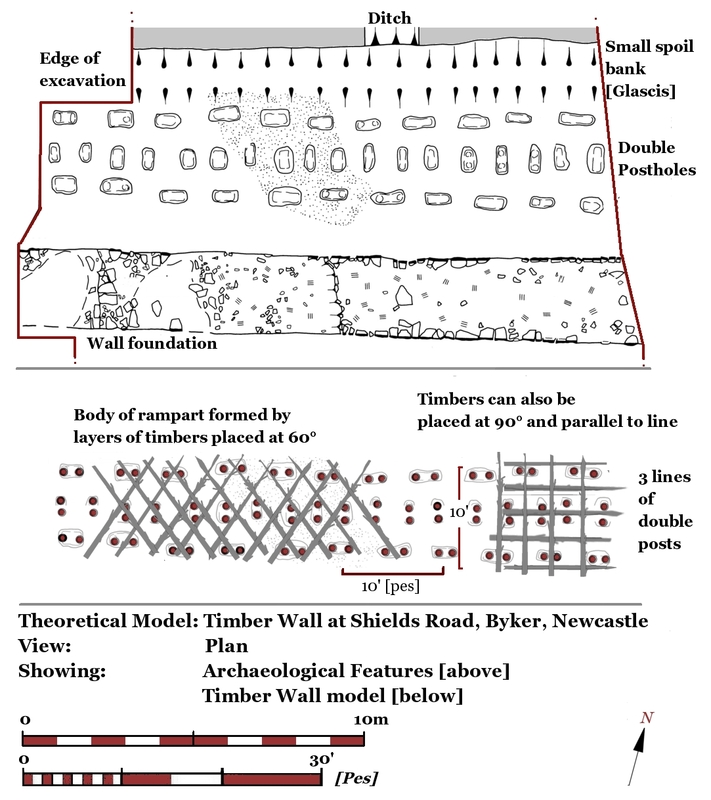 My initial modelling of this and other similar evidence was on paper, and later with a matchstick model, indicated that this was a timber rampart, which along with ditch formed the initial phase of the frontier while the stone Wall was under construction. The technique of rampart building is frequently discussed by Caesar in his account of the Gallic wars, and was a very standard procedure for troops, as discussed in Epitoma rei militaris , although the key insight comes from Polybius Histories  [Discussed here]. Caesar’s standard rampart is made from timber 12 feet high, with a ditch in front, it probably had wattle battlements and a parapet of sharpened branches. There are also frequent towers, and galleries are mentioned, allowing defenders to concentrate their fire from more than one fighting platform. The structures at Shields Road and Buddle St,  appear to be laid out in Roman feet; I always prefer to work in ‘Imperial’ on ancient structures, and make no apology for this as they patently make no sense in metric. The purpose of the model is to test the basic engineering principles deduced from the plan and section data, in particular to produce a better technical representation of how a rampart might be constructed around the particular spatial distribution of the posts evidenced at Shields Road. The model is built timber by timber, starting by placing posts in their recorded position on the archaeological plan. The theoretical horizontal elements are then added in layers of similarly aligned components, fitted around the vertical posts. The model is set on a surface 2’ above the archaeological plan, with a restored ditch and spoil banks providing a broader context for visualisation. A selection of timber baulks and posts were prepared as components, based on the diameter trunks indicated by the posthole sections, up to 10" / 25 cms. [Below] These are around 25 cm in diameter and taper, ending with a nominal point. Ranging in length from 24‘ for the longest posts, to 14’ for the standard posts, with the baulks forming the body of the rampart 10 – 12’ in length. 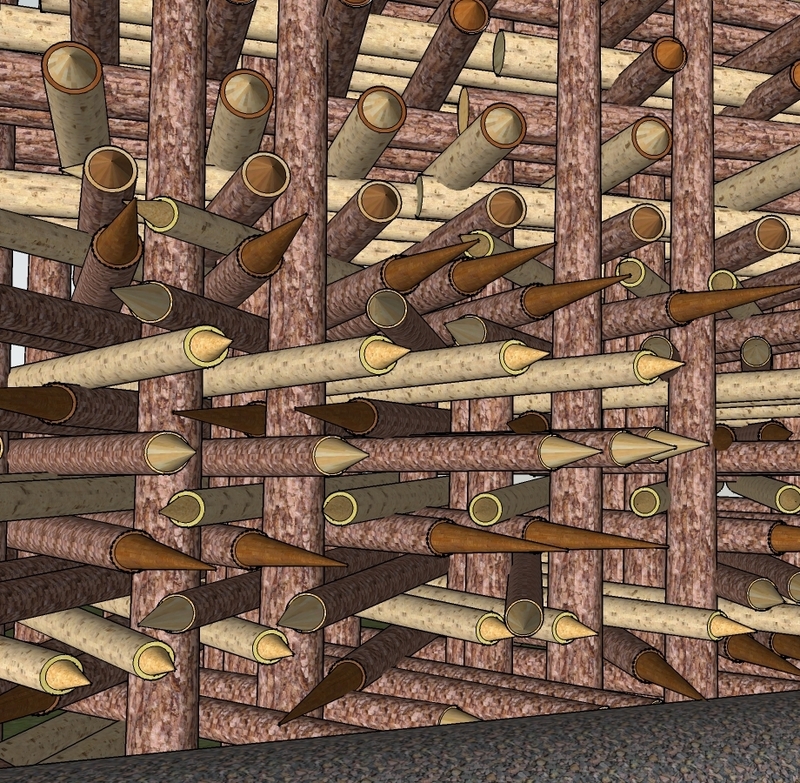 In addition, some more twisted branches were created to simulate the parapet. 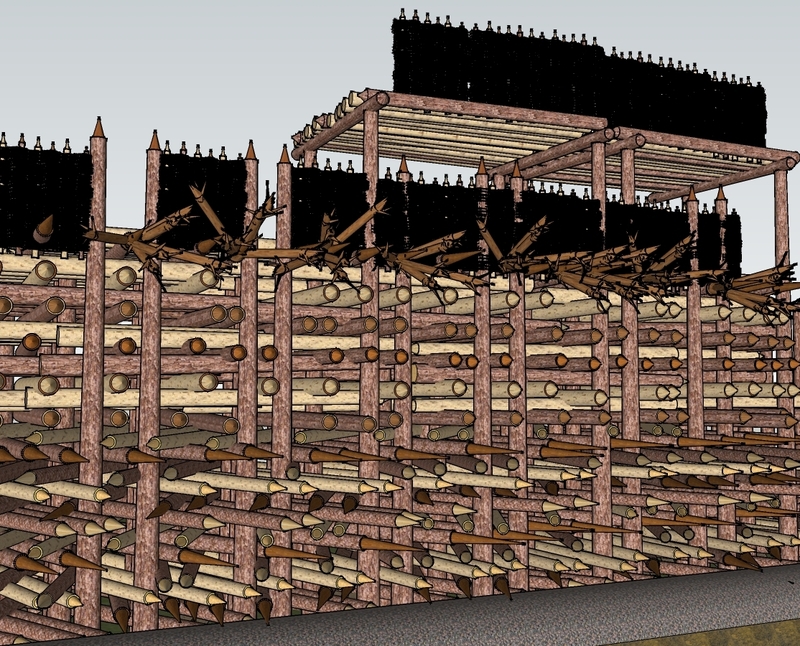 Finally, wattle panels for the battlement were created. 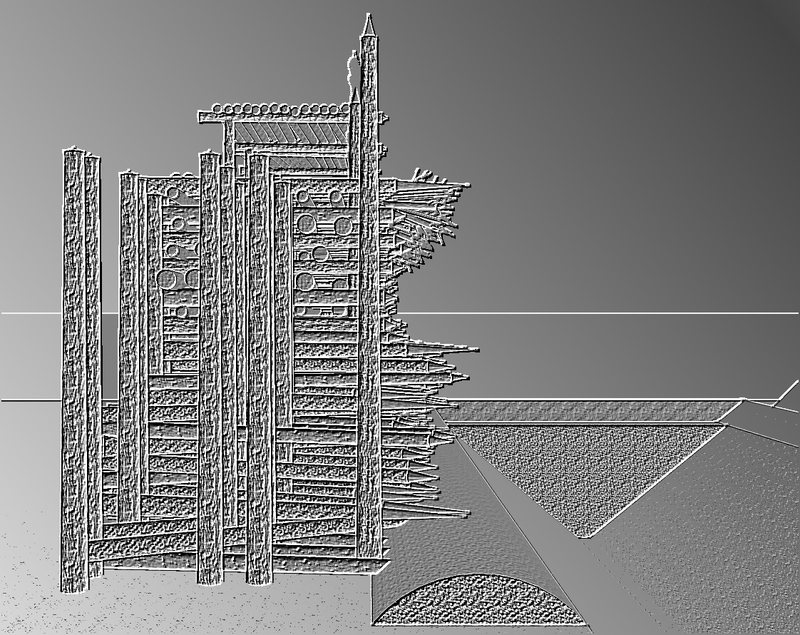 These are quite detailed and probably require as much processing power as the rest of the structure. Differing textures and slight variations in size were used systematically to help distinguish the layers.There is no particular indication as to in what sequence was used, but for clarity I placed diagonal baulks at the bottom, and the regular ones at the top of the rampart. This has the advantage of emphasising the projecting parapet, but exposes the posts which are obscured by the ends of diagonal baulks. A mix of diagonal and regular baulks throughout would be probably the most advantageous method as it would help keep the body of the rampart level. It was decided not to place baulks parallel and in front of the posts, as these would be easily dislodged. As layers of timbers were fitted around the posts, some variations occur due to there being a range of possibilities and a degree of latitude in the placing of some of individual pieces. The model is based on the use of the spaces between the posts to create an impenetrable and unbreakable barrier, how to fill these spaces is to some extent self-evident, but does not address in detail what happened at the head of the posts. In a model of a post built building this would be the crucial analysis, but in a temporary military structure it less significant to the understanding the structure as a whole. 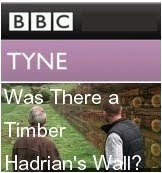 The extent to which joinery, and or iron nails, would have been used impacts on how the tops of the posts are modelled. The upper fighting platform is supported on beams between selected pairs of posts which illustrate how this could be achieved. It does illustrate the advantages of the projecting diagonal baulks which help hold the post in place and prevent the attacker getting any purchase on it to pull it out. 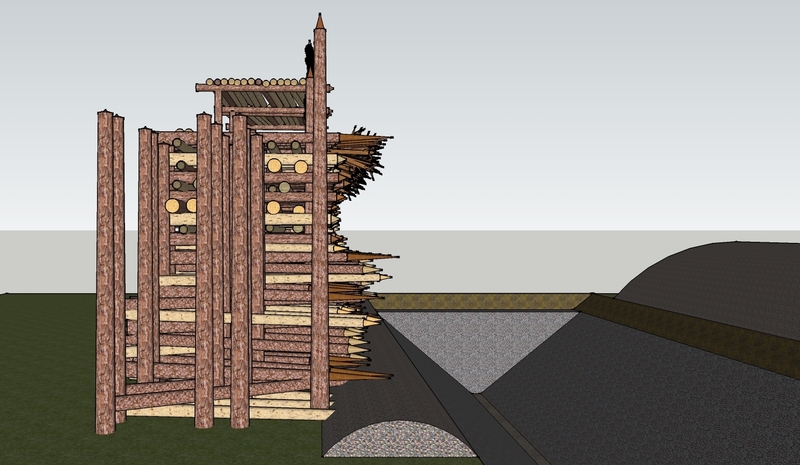 As already noted, the model does not address the issue of taper; if all the timber tapers towards the front, the body of the rampart will slope down in that direction; it simple to address in the [real] construction process, but would have added to the visual complexity. This returns us to issue of visual representation; in my initial #1model, I had tried to create a more realistic and random looking structure, but this detracted from the central purpose of demonstrating the engineering principles. The efficiency of the model could be further improve by using thinner baulks or shorter which might be fitted into the tighter gaps. Indeed one of the more interesting aspects of the structure are the bits that don’t work very well, as they are the key to further understanding. Shields Road is 16m sample of a structure with about 50 posts per 10m, and while other evidence from elsewhere confirm the presence and regularity of the postholes , there is as yet insufficient data to fully understand the pattern. 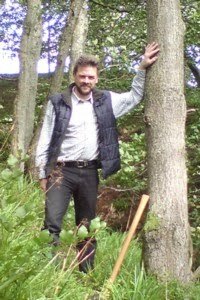 Looked at terms of foraging Woodland resources; the longest straightest ‘building’ timbers, and baulks split from larger trees would be used for the posts, the scale of which clearly determines the scale of the rampart. 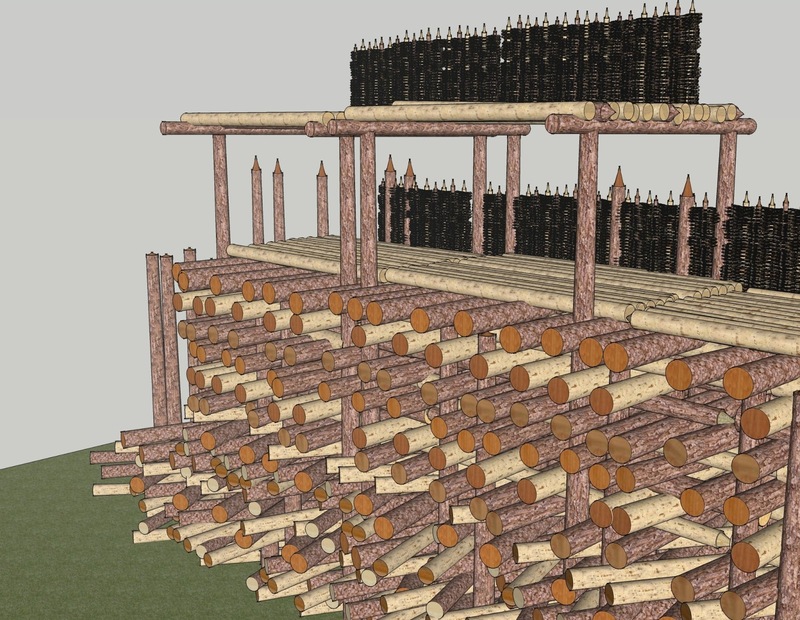 The body of the rampart would presumably utilise the larger heavier timber towards the bottom, with lighter thinner baulks, even bundles of sticks, used higher up, where they are less lightly to be dislodged. The thinnest saplings and be used for the wattles, to form battlements and hoardings, while the irregular wood from the side branches and crowns can be used to form a parapet to prevent climbers. This type of design is very flexible and adaptable to circumstances, and would, for example, have required stairs to reach the fighting platform, as well as other specific adaptations to suit differing circumstances. Fresh cut timber does not burn readily, and its inherent irregularity and branch stubs would aid interlocked nature of the structure. While what remains are stone forts and walls built by the Roman army, in many ways these are exceptional; what the army normally did was build timber temporary structures, which could withstand the prolonged attack of a determined enemy, and there can surely be little doubt that these postholes at Shields Road and elsewhere north of the wall are the foundation of such rampart. In reality I found the process time consuming, fiddly and frustrating; any joy of realising an ideas in virtual 3D, was offset by the seven complete rebuilds that are an inevitable part of the learning curve. 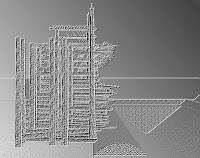 However, it in my particular technical circumstances is a perfectly viable tool; now that I am learning how to use it efficiently, I am looking forward to tackling more complex issues such as post built buildings. The ability to photo-texture components is helpful, and a high degree of ‘realism’ can be developed by introducing a greater number of individual components as variants. I am confident that I will be able, with patience, to use SketchUp to build 3D models of the archaeological buildings I have been discussing and illustrating in plan and section. Beyond this, the wider potential of Google SketchUp to share and distribute this information is extremely exciting. See also; Bidwell, Paul T.; Watson, Moira. 1989 'A Trial Excavation on Hadrian's Wall at Buddle Street, Wallsend'. Archaeologia Aeliana, 5th ser., 17 (1989), 21-28. And thanks for your assistance. It's going OK with Sketch up; I'm in the middle of modelling Woodhenge, which is a couple of months work, as I am still testing aspects the assembly. I will check out your New Vid - expect a review!